The big match of the day features last season’s runner-up Pro Recco (ITA) and Euro Cup winner Ferencvaros (HUN), two giants with a strong chance of going all the way to the final. At the same time title-holder Olympiacos (GRE) is seeking its first win while the re-match of the 2017 final between Jug (CRO) and Szolnok (HUN) also promises some extra excitements. Both Recco and Ferencvaros kicked off its respective campaigns with two wins and have also remained unbeaten in the domestic league (and cup). The clash of the titans will see a handful of Olympic and world champion players at both ends, it’s a must-watch game for all water polo fans. The current leader of Group A Barceloneta (ESP) faces its first serious test in Moscow where Dynamo (RUS) is set to bounce back from back-to-back defeats suffered in Hungary on the first two days. Last season the Spaniards earned an easy 9-5 win in Russia, though their first battle in Barcelona ended in a 7-7 tie. Eger (HUN) had a loss then a win, now it’s another home game against Steaua – the Romanians went down in their opening home matches but each was a tough battle so the Magyars cannot take anything for granted. Brescia (ITA) is looking forward to an easy task, the young side of Crvena Zvezda (SRB) was soundly beaten in Belgrade twice, playing away might be even more challenging for the Serbs. 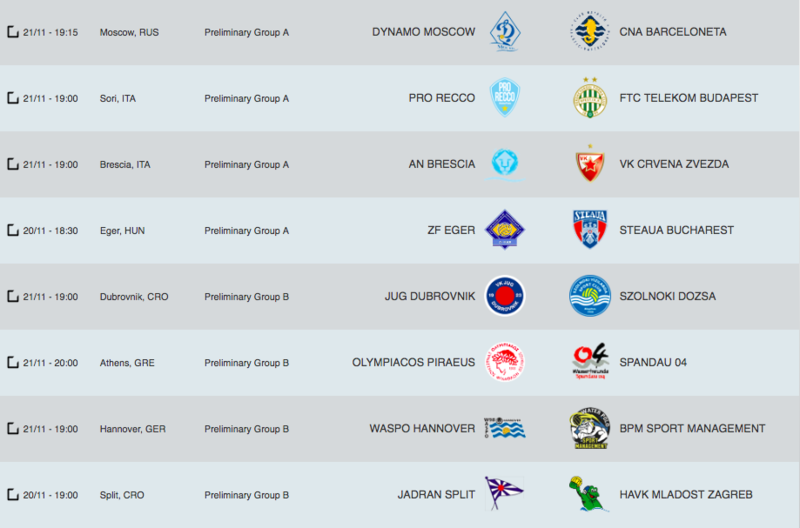 Group B was already thrown into ‘turmoil’ as Busto BPM upset both 2018 winner Olympiacos and 2017 champion Szolnok – the Italians now pay their first away visit and play with Final Eight host Hannover (GER) which had two ties so far. Olympiacos could collect only one point in two away matches, a home victory against Spandau (GER) is a must for the Greeks. The Berliners would love to earn a positive result at last after two narrow defeats from their Croatian rivals but to achieve that in Piraeus seems to be pretty hard. The re-match of the 2017 final between Jug and Szolnok will offer further insights of the reshaping process of both sides. They have had some ups and downs so far, though Jug was upset only in the regional league while Szolnok already lost a crucial game in Busto in the Champions League and was ousted from the national cup recently (by OSC, after a huge 8-goal defeat). Another in-house meet of the Croats is due in Split where Jadran could finally play at home where they face Mladost. The team from the capital is yet to leave the country, they earned four valuable points against the two German sides in Zagreb now they travel to the Adriatic coast to maintain their unbeaten run – in fact, they already beat Jadran 6-9 in Split three days ago in the regional league so it’s going to be interesting to see which side learnt more from that encounter. 1. Jug 6, 2. Busto BPM 6, 3. Mladost 4, 4. Szolnok 3, 5. Hannover 2, 6. Olympiacos 1, 7. Spandau 0, 8. Jadran 0Champions League Preliminary Day 3. Here the schedule of the matches that will be played on Wednesday 21st.